We cannot force anyone to like our religion and we cannot be forced as well to like others. With this, we should have the urge to choose the right religion for us. But for us who are searching for the right religion to affiliate with, whether we should be Christians, Muslims, Buddhist and others, we should have a clear conscience and we should be driven by our desire to worship the “God” that we desire than any other reasons. I am a Christian, but I love other people. 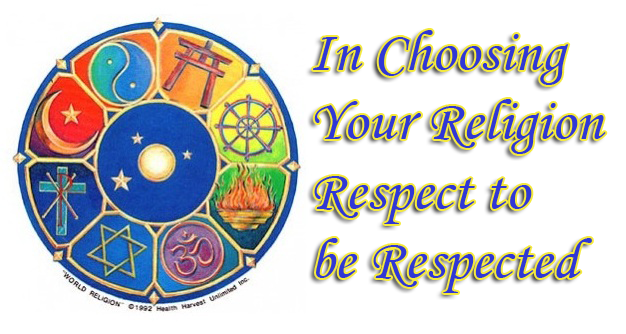 I respect other religions with regards to their practices and ways of showing reverence to their “Gods”. I already mingled with different people of different religions ranging from Muslims, Buddhists and Shinto and I found out that there’s no problem mingling with them because I always show positive attitudes. You see that showing positive attitudes towards others with different practices will allow us to have a connection with them. We need to show respect to them not because of their religious background, but in the sense that they are also humans and they deserve to be respected with the same respect that we want from them. If we want to be respected and accepted with our religions, we need to show to others first the kind of respect that we need. And if we have the desire to convince them to believe our dogmas, we should show love to them no matter what. There are times when we are rejected and not accepted because of our religion and I advise we should be humble.